Center-stage is a series of articles spotlighting a particular model or unit in Godslayer. 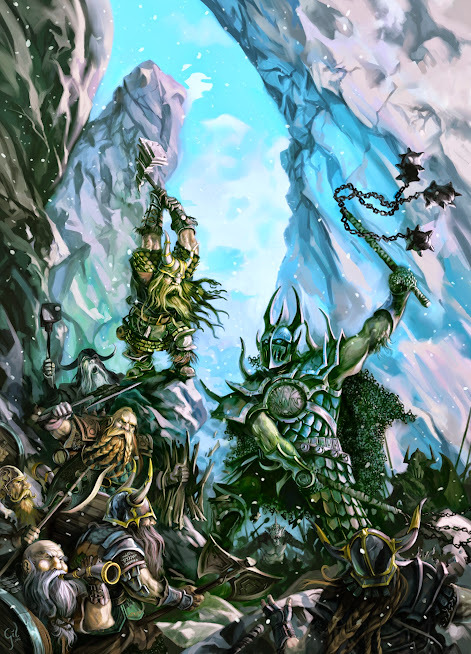 In this article we look at the starter-box warlord of the Nordgaard – the mighty Warsmith. To get the most out of the Warsmith, we recommend you also read the Center-stage article about the Fjell Warriors. Warsmith is the title given to the master blacksmith of every clan, each one a craftsmen and fighter of great renown. The brush and canvas of this warrior-artist are his hammer and the anvil, and unlike the famed Rhundras, the Warsmith does not employ runes – rather he is an expert in metals and forging techniques. Warsmiths work the celestial metal of the gods, called orichalcum, and they are guardians of the secret formula of Nordgaard Steel – a combination of wrought iron with iron ore, mixed with charcoal and glass which is sealed and heated together in a furnace. Nordgaard Steel is identifiable by the alternating grain pattern and is highly sought after all across Calydorn. Through hand-forging the Warsmith is able to produce pieces much stronger than cast items (like those of the Mortans) by aligning the internal grain to follow the shape of the weapon. His skills include advanced techniques such as folding and twisting to produce ultra-hard blades and forge-welding to combine different metals for increased flexibility. Apart from the practical aspects of his masterpieces, the Warsmith is a master craftsman fashioning intricate decorations by hammering and acid etching. The Warsmith is a true artist but not only within his forge, for the battlefield is the perfect gallery for the bloody side of his art, where his hammer paints a crimson picture of carnage. Seams of orichalcum ore crashed down onto Calydorn inside mountain-sized rocks when the former world of the gods was shattered, and Nordgaard’s Warsmiths are the only individuals in the world who understand how to manipulate it. Weapons made from Orichalcum are feared by supernatural entities, for they vibrate across multiple dimensions, thereby nullifying the ethereal nature of creatures such as Demons Elementals and Aetherions. The Warsmith is also adept at forging armor and weapons which channel the elemental powers of Earth, and such items rival even the rune-weapons of the Rhundras. Once every century the Warsmiths select apprentices from among accomplished village blacksmiths, and these master-smiths then undergo a century of further gruelling training before becoming Warsmiths themselves. In order to understand weapons and armor properly, the apprentice must also be an accomplished warrior. In times of war, the Warsmith joins the leaders of his clan in battle for he is warrior of great prowess. Indeed, the Warsmith must continue to perfect his fighting abilities to improve his skills in forging the tools of war. The profile card tells us that the Warsmith is a warlord of the Clans sub-faction and is classified as standard infantry. At 40 points, the Warsmith is one of the cheapest warlords in the game and great value considering his versatility. I count he Warsmith as an all-rounder warlord, meaning that he is both good in melee and also good at supporting units. To get the most our of all-rounder warlords I try to use them as supporters as much as possible, then throw them into the melee only in the final two rounds of the game or in the case of an extreme emergency. MOV 2 – Hmm that’s bad; but his is a Dwarf, so fair enough. MEL 8 – Okay for an all-rounder but less than the best melee-warlords. MAG 4 – Average for a non-spell-caster. DEF 13 – Below average for a melee warlord, indicating Dwarves lack of maneuverability. ARM 8 – Normal for a melee warlord, so here there is no deficiency. LEAD 9 – low-average for most warlords. The Warsmith is not a natural-born leader like a general, rather he is a specialist who commands great respect. ACT 6 – Standard for warlords. With 17 life-points he is a bit tougher than the average human melee warlord. Overall the Warmisht seems to be unimpressive in terms of stats, but as I already mentioned, I consider the Warsmith to be an all-rounder rather than a melee-master. As you will see below, his mediocre stats are more than compensated by his awesome tactics. Earthbound – Enemy spells targeting the Warsmith suffer -2 on their spell-casting roll. This effectively gives the Warsmith a MAG of 6, providing him good protection from enemy spells. For example an average mage with MAG6 casting a complexits10 spell needs to score a 10+ to be successful. With such odds, few spellcasters are likely to target the Warsmith. knockback effects such as Skewer from both the Scorpio and the Stormbow Beasthunter, Chainslayer’s Grapple-Drag, Fjellgangr’s Kick, Duskborn Chieftain’s Slam Back. He is also safe against Knock Down such as with Banebrood’s Black Plague, Hammerfist’s Tactic Rumble, Ironhide Brutes Critical Knockdown, Warsmith’s Chasm Cracker, Fleshpounder’s Beatdown, Bloodvarg’s Pounce, Lord of Decay’s Mass Grave. That’s two great benefits in one sub-faction ability. Armor Knowledge – The Warsmith is an expert in armor, able to exploit their weak-spots. enemy models suffer -1 DEF and -1 ARM from the Warsmith’s attacks. Now the Warmsith just became a whole lot better in melee. Now he effectively has MEL9 and an extra point of POW! Fire Resistance – As an expert blacksmith, he is accustomed to the insufferable heat of a forge. the Warsmith is basically immune to fire. Okay, not so special; perhaps useful against Mortan Technostratum and some fire-spells. We put this rule in here for fluff reasons and because in the future there will be many more effects using fire. Fjell Commander – The Warsmith uses a system of hand-signals to give orders over the din of battle. Models with Clans sub-faction are not required to make LEAD tests for receiving tactics ordered by the Warsmith. This is one of the reasons why the Warsmith is such an great all-rounder. Note that there is no restriction here like “within LEAD range”, it allies across the entire battlefield! Chasm Cracker – Using elemental Earth energy, the Warsmith cracks a wide fissure in the ground, 4 inches across the battlefield which can knock down enemy models whose bases are crossed. With this tactic, the Warsmith can knock down half a unit! Knocked down models suffer -2 DEF, cannot use tactics and they need to pay 1 ACT to stand up in their own standard activation. Not that since the knocked down models cannot use tactics, this cancels their Phalanx or Testudo, Defiant in Death etc! Embolden – The Warsmith is a charismatic and imposing figure who inspires the troops around him. One model unit gains +1 MOV for charging. This is one of his really useful tactics which can make a huge difference for Dwarves, increasing their charge range from 6 inches to the normal 8 inches. But wait, it gets even better, there is nothing preventing the Warsmith ordering this tactic to Skannfyrd humans and Myrgaerder Ogres who already have MOV3, thereby giving them a 10 inch charge range. And how about the Valkyrie – she can benefit from a charge range of 12 inches. Unfortunately Fjellgangrs and Bloodvargs do not benefit since they are creatures and cannot receive ordered tactics. Grindstone – Using elemental power, he causes arrows and blades to become sharper and harder. target model/unit gains +1 POW to its melee and missile attacks. Not very powerful but extremely useful by all models! Even Fimbul Toughborns can benefit from this, increasing their POW to 4. Shatter – The Warsmith channels earth-power at his enemies, weakening their armour and weapons. This one is an awesome tactic. The target enemy model/unit suffers -2 on melee damage rolls or -2 ARM. Shatter is useful for both offensive and defensive strategies, crippling the opposing unit’s POW or effectively giving your own troops +2 POW. In most cases I would go with reducing the enemy POW, because when you combine this with the good armor of most Nordgaard models and their life-points, you make them very solid. Sometimes it is better to cause the -2 ARM on an enemy unit, especially when your warband is facing enemies with great armor. If you are in a position to charge with one of your units, you can improve their offensiveness by crippling the enemy with -2 ARM – effectively increasing the POW of your chargers by +2. When you combine that with the tactic Grindstone, and charge bonus (or powerful fighting style), then you are giving your guys +4 POW! Remember you can use both Shatter and Grindstone together because one is applied to the enemy and one applied to your unit. Imagine giving this to Einherjer, giving them an effective POW of 11! A full unit of Einherjer making 2 attacks each at POW11 will utterly annihilate any unit of enemy elites in a single round. The Warsmith can also use this combo himself which when combined with Armor Knowledge ability and charge bonus with give him effectively +2 MEL and +5 POW. This is a nice combo for attacking an elite unit since he will likely need 3’s to hit and 3’s to kill, destroying the first model and gaining slay-movement to kill a second. But this does not only apply in melee, how about giving your Fimbul Toughborns Grindstone and their target unit Shatter. Then you can potentially unleash 12 crossbow bolts per round with an effective POW of 6! Our Warsmith is entitled to take 4 items: 1 double-handed hammer, 1 suit of armor, 1 talisman, and 1 potion. Warhammer – A nice cheap option in case you are running low on points, allowing 2 attacks at POW7 per turn. Stonesmasher – This is the basic Warhammer but with POW 8. Nice. Doomangr Devastator – This one is awesome when facing horde warbands of cheap models. It is a 3-inch AOE attack placed anywhere in contact with the Warsmith’s base, and causing POW 3 attack against every model even partially under the base. When combined with his tactic Shatter, this can even by good against Hoplites in Phalanx and Legionnaires in Testudo. Mammoth Bonecrusher – Allows you to reroll one attack die and has critical knock down. When facing elites, melee characters and warlords, it can be useful since you will basically hit them still with almost every attack. Earthpounder – Excellent in case you find yourself engaged with a killer melee warlord. With this hammer you can knock the opposing model D6 inches away. This can put that model in an embarrassing position where he can be charged or trap him in melee. If you play with cliff-tops, high-buildings or other hazardous terrain, the Earthpounder can be even more amusing. Runehammer – Like the basic Warhammer but with +1 strike rank, meaning you make your attacks before the enemy (unless they also have SR1). This is useful when facing rank and file unit models like Bladeslingers, Reaver Tribesmen, Runts and so forth because you can kill the enemy before he can make a counter attack, even if he charged you! Against warlords though it is not soooo helpful because the opponent will probably survive 1-2 hits. It might make a difference in a warlord duel but maybe not. Grimhammer – One of my favorites; it’s just like the basic Warhammer but you get 3 attacks per turn. Maybe not so fun as the Earthpounder or the Doomangr Devastator, but very flexible and useful in all situations. This is an awesome selection of weapons, really spoiling one for choice. Mirrorplate Armor – Provides -2 to hit for missile or magic attacks. When facing models with MAG attacks (Wycca Warriors, Longshadows etc). This is of course very cool. Also great against shooty warbands. So this one really depends on whether you believe you will be facing such enemies. Breastplate of Magnetic Deflection – gives +1 DEF. Useful in every situation, giving your Warmisth DEF14. Greaves of Resilience – Allows your warlord to return to life on a 5+. Cool but I would rather avoid putting him in the situation of having a 33% chance of not dying. Titanium Armor – Gives +1 ARM and immunity to continuous effects. This is especially useful against Banebrood and Mortan warbands, and the +1 ARM is always useful, giving your Warsmith ARM9. Combine this with Shatter against attackers and your Warsmith will be almost invulnerable. Fimbul Boots – Gives the Warsmith Wildwalker. Useful depending on your strategy. You could give the enemy a nasty surprise by charging them across difficult terrain. Runeplate Armor – Basically cancels all damage bonuses of any kind. When facing combat warlords this could be very useful but I would generally not take it for the Warsmith because against most opponents it will only reduce the POW of attacks by about 1 point. Trollhide Pants – Provides Concealment. This is great since opponents cannot charge, shoot or cast spells on you unless they get within 6 inches of the Warsmith. Generally I would go with titanium Armor or Trollhide Pants if I can afford it. Adamantine Glyph – Immunity to missile and magic attacks; similar to the Mirrorplate Armor, but even better. Lodestone of Luck – Reroll one die each round. This one is very useful, especially for the Warsmith for his tactic rolls to use Shatter and for Groundmeld movement dice or his attack rolls to knock down enemies with Chasm Cracker. And it’s just generally useful in melee to reroll a 1 on a melee or damage roll. If you play the Warsmith as a support character, you should keep him out of melee until later in the game, and so it is realistic to take this item instead of a protective talisman. Spirit-link Amulet – Causes D3 damage to models damaging the Warsmith; useful for melee-warlords. Runes of the Forefathers – 4+ protection roll halving damage received. Excellent item in any situation. Healing potion – Quite useful tempting to take. Groundmeld Potion – This is the one you need. Always take this potion. Not only does it allow you to gain extra movement one turn, it also allows you to set-up unexpected charges (see “Surprise Charge” strategy below) and to set-up awesome Chasm Cracker knockdowns. In addition, it can allow you to escape from a messy melee that you are losing since using it does not allow the engagers to target you with free-strikes. The uses of this potion are almost limitless. The following models work exceptionally well with Warsmith. • Brewer of Odrorir – A handy fellow to have around. His brews can buff your units with excellent synergy to the Warsmith’s tactics especially because the Brewers brews are a special talent, not tactics, so can stacked in addition to ordered tactics from the Warsmith. Guarding Draft gives +1 DEF. Strongarm Ale is great for when your units are making attacks or charging, giving them +1 MEL & POW, but costing them -1 DEF. • Bloodvarg – An absolute must. I recommend to take as many as possible in a Dwarf-heavy Nordgaard warband since they will go a long way to neutralizing your main deficiency of stumpy legs. • Valkyrie – With her Verses of Fjarla, the Valkyrie can heal the Warsmith. Together with his good armor and items as well as his 17 life-points, he becomes near impossible to kill. Movement – The Warsmith has very limited movement with a maximum of 8 inches per turn and charge range of 6 inches. This means he can easily be charged and out-manouvered. You really do not want your warlord getting charged, so here are some tips. Firstly he works best with a warband that is mostly compose of Dwarves since they all move at the same speed. Secondly, you should always keep him shielded behind a unit or creatures until the enemy has charged your units, then he can be making charges. 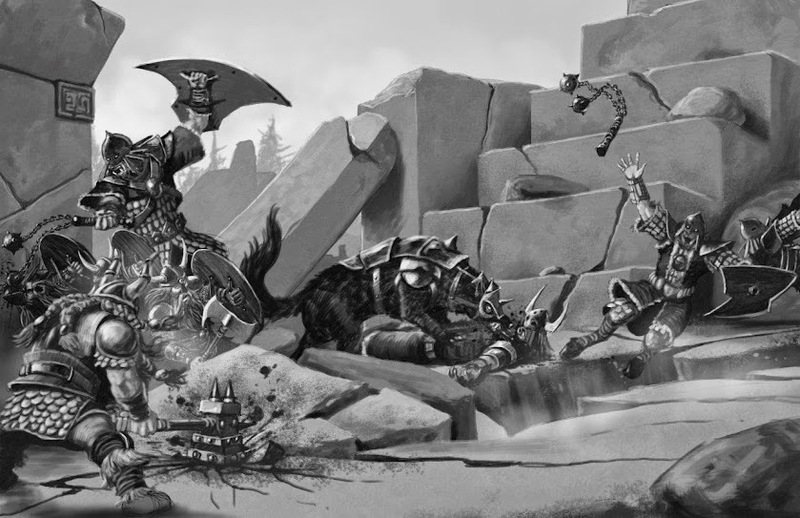 Even so, be carefully with his placement because in the last rounds of the game he can often find himself prone to charges again after the opposing warbands have massacred each other and left no units to hide behind. The Groundmeld potion is extremely useful, providing you 2D3 extra movement which does not even count as movement. This is the classic strategy of absorbing the enemy charge and then responding with heavy hitters. For this formula you will need one Warsmith equipped with Groundmeld potion, one or more large units of Fjell Warriors, one Brewer of Odrorir and one Fjellgangr as well as one Chainslayer. Optional: double up the warband with another unit of Fjell Warriors and another Fjellganger and Chainslayer. Take full units of Fjell Warriors and place them in Shield Wall (+1 DEF and +1 ARM). Place them in single file and leave a small gap near one end of the line (remember, they only need to have base contact to one other model to benefit from Shield Wall). Behind the Fjell Warriors, between the gap and the end of the battle-line, place the Warsmith so he has line-of-sight through the gap to the most dangerous unit/model lining up to charge your Fjell Warriors. He needs to have LOS to the enemy, but it is also good if he can be placed slightly to the side of the gap towards the end of the unit. This is important because he needs to have space to move into with his Groundmeld Potion next round. Now activate your Warsmith and use his Groundmeld Potion. Move him under the battle-line of the Fjell Warriors, placing him in base contact with the enemy models engaged with your Fjell Warriors. There should be now a nice, neat line of enemies. Now use the Warsmith’s Chasm Cracker tactic and you will probably knock down 3-4 enemy models. Now use the tactic Shatter on the enemy unit with highest armor that is nearby, causing them to suffer -2 ARM. (Alternatively to using Shatter, if there are lots more enemies lined up, you could also use Chasm Cracker a second time). Finally, order the tactic Grindstone (+1 POW) to your Fjell Warriors and assign them an action token. Include in your warband a couple of Chainslayers and Bloodvargs. Pin enemy units by engaging them with your Bloodvargs and move up your Chainslayers so that are no more than 5-6 inches away from the enemy unit. In the next rounds, activate your Warsmith and use the tactic Grindstone on your Chainslayers and Shatter on an enemy unit, then assign your Chainslayers 1 action token each. Now move your first Chainslayer twice into that unit so he is in melee range of as many enemy unit models as possible. He will now be making a Thrash attack against all models within 2 inches (probably 4-5 models). This attack normally has POW2 but now he will have an effective POW of 5! After that he should have 2 ACT left over to make a second Thrash attack! Next turn do the same with your other Chainslayer, and you will have massacred the enemy unit in a raging storm. As a Variant, try this with Fjellgangrs. These brutes cannot benefit from tactics, so no use ordering Grindstone to them, but you can use Shatter on the enemy units and use the Fjellgangrs in the same way to make their Thrash attacks. These guys will also now be attacking all models in 2 inches at POW5. For this trick you will need the Groundmeld potion and a large unit of 5-6 Fimbul Toughborns. Place your Toughborns preferably on a hill or off to the side, and put your Warsmith quite far forward (up to 9 inches away from the Toughborns). Order the tactic Grindstone to your Fimbul Toughborns then move forward 2-3 times in order to get within range (9 inches) of an enemy unit, and then use your tactic Shatter. Use the Goundmeld potion to retreat backwards as far as possible. Now activate your Toughborns who can unleash 12 crossbow bolts this turn with an effective POW of 6 at short range and POW 5 at long range. If the enemy is 18-20 inches away, you will be able to do this trick at least once more before they get to your Toughborns. This is great for taking out spell-casters and squishy models that the opponent has safely hidden behind a defensive unit. For example, the opposing Halodyne player has his Oracle and a Priestess 8 inches behind a unit of Hoplites. I engage/charge the Hoplites with my Warsmith, remembering to always support him with a unit or creature. Next round, I use the Groundmeld potion to move under the hoplites 2D3 inches. This action does not count as movement, so I am still able to make a charge, so now charge the Oracle and execute her in one turn. Buff your warlord with Guarding Draft (giving +1 DEF) so he now has DEF15, ARM9 and 4+ protection roll. Put him in a convenient location to be charged by the enemy warlord. If possible, use Shatter on the enemy Warlord, but you MUST keep 3 Action tokens in your pool. Now wait to be charged be the enemy warlord. Place your 3 Einherjer at right angles to the Warsmith, but 5 inches away. Arrange them in a half circle with the open circle pointing to the Warsmith. Because of all your buffs, your Warsmith will definitely survive the charge attack of the opposing warlord. Now attack the enemy warlord with the Earthpounder and knock him 4 inches away into the half circle of waiting Einherjerr. Then use Chasm Cracker to knock the warlord down. The opposing warlord will now be occupied for the rest of the game until he dies. 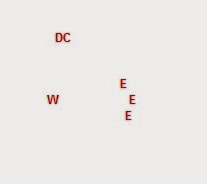 He does not dare move away because he is now engaged by 3 of your elite models and if he moves away he will suffer free 3 mighty free-strikes at MEL9, POW9. The enemy Warlord will spend all of the rest of his ACT on melee attacks desperately trying to survive, while your Warsmith can now go on about his business. You will need the same as above but instead of 3 Einherjer, take a unit of Toughborns. Lay out a line of 4 traps (across 6 inches) with your Fimbul Toughborns and place your Warsmith next to one end. Allow the opposing warlord/creature to charge you. Use the Shatter tactic against the warlord/creature (reducing his ARM by -2). Then use the Earthpounder to knock the enemy warlord/creature sideways through all 4 traps, causing him to suffer 4 automatic damage rolls with an effective POW of 4 (due to Shatter). Against a Horde warband there is a nice trick. It is especially effective against Gnolls, Bladeslingers, Reaver Tribesmen, Mongrels, Legio Mortum and Hoplites. You will need to arm your Warsmith with the Doomangr Devastator and the Spirit-Link Amulet. You will also need a full unit of Toughborns and a Valkyrie. Try to get the Valkyrie on the table as early as possible. Place the Warsmith at the bottom of a hill, with your Fimbul Toughborns and Valkyrie on top. Use the Warsmith’s tactic Shatter on the nearest enemy (you might need to move once or twice to do that. The Groundmeld postion is useful here). Be sure to move him back so that he is within 12 inches of the toughborns. Use the Toughborns Stand Ready tactic, and place the 4 inch AOE template covering the Warsmith. Every model charging the Warsmith will suffer an automatic POW3 damage roll. If the unit charging is the one suffering Shatter, then the automatic hit will be effectively POW5. Any models that manage to wound the Warsmith will suffer D3 direct damage from the Spirit-Link Talisman. If the hordes really pile in, then next round, use the AOE attack of the Doomangr Devastator to thin out the enemies formations. Each round the Valkyrie can keep the Warsmith’s life-points topped up. • Ordering Grindstone to Skannfyrd Kinswords not only increases their sword POW to 4 but also increase Shieldbash attack POW to 2. • The Warsmith is so cheap in points that you should consider equipping him with all four possible items. If your strategy does not call for a particular weapon, then try taking the standard warhammer for 4 points, allowing you to spend more points on other items. • Beware models with direct-damage attacks (Banshee, Fleshpounder, Lighteater, Longshadows, Reaver Tribesmen, Wycca Warriors etc). These foes will negate the considerable armor of the Warsmith. 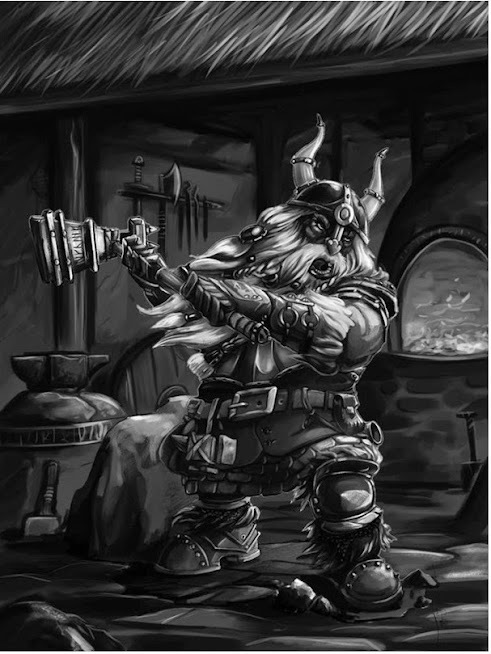 The Warsmith was designed thematically to exemplify the forging aspect of the Dwarves and their connection to the old gods of the elemental earth. 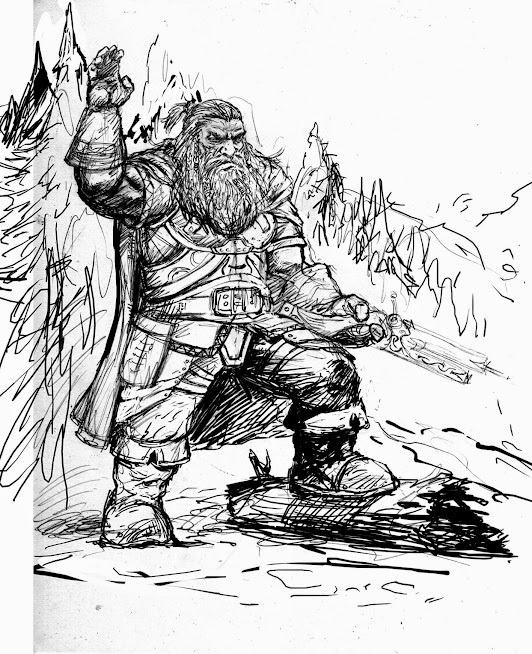 We wanted to make a warlord that was something different to the typical Dwarven lord human or Jarl, and his background also helped inspire us in the creation of the different sections which make up Nordgaard society. Unlike the Rhundras, the Warsmith was a master of smithing regular metals, possessing great artistry and technical knowledge in all advanced techniques. Most significantly, he is a guardian of the formula of Nordgaard Steel – bequeathed to the Dwarves by their earth-god masters. Warsmiths are also some of the few who are able to work the metal Orichalcum which fell to the world of Calydorn form the shattered former world of the gods. His tactics and abilities were created to reflect these skills. We also wanted the Warsmith to be a decent fighter in game terms and more than just a great blacksmith, so we justified the “war” in his name by adding the martial aspect of his background which rounded him out nicely, creating something new and unusual. The Warsmith was the first warlord designed and like the Fjell Warriors, he was used as a template and benchmark for the creation of other warlords for the first three factions we developed (Nordgaard, Halodynes and Wyldfolk). In fact the very first tests of the game mechanics were done on my dining room table by Andre and I with the Warsmith, back before we had even conceived the fundamental action-token system. Over the next four years of play-testing, the Warsmith changed insignificantly, with only a minor alteration in his points and a little re-wording of his tactics. Unlike most of the models he stayed essentially unchanged. As with the first warlord of several other factions, the Warsmith is an all-rounder warlord or a combination of buffer and fighter. This was intended so that players would have a wide range of options even with starter-box games. For this reason he is quite versatile, with his only real deficiency being his speed. The Warsmith is definitely not the best fighter warlord of the Nordgaard, but for leading a Clans sub-faction warband he represents a great tool allowing Dwarves to be played with diverse strategies.